Source: Epoke North America Inc.
IGLOO is a belt spreader for small vehicles. The spreader is hydraulic and operated by means of a built-in petrol engine or by means of the vehicle hydraulic system. 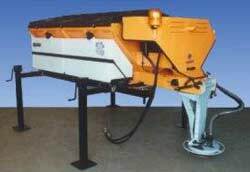 The spreader is available in normal as well as stainless steel. IGLOO, model S-2400 features width and quantity compensation as well as road-speed relation thus ensuring that the adjusted quantity per m² remains constant, even if the spreading width or the speed of the vehicle is changed during operation. Epoke North America Inc., 10 Trent Drive, Campbellford, ON K0L 1L0. Tel: 705-653-0317; Fax: 705-653-4732.